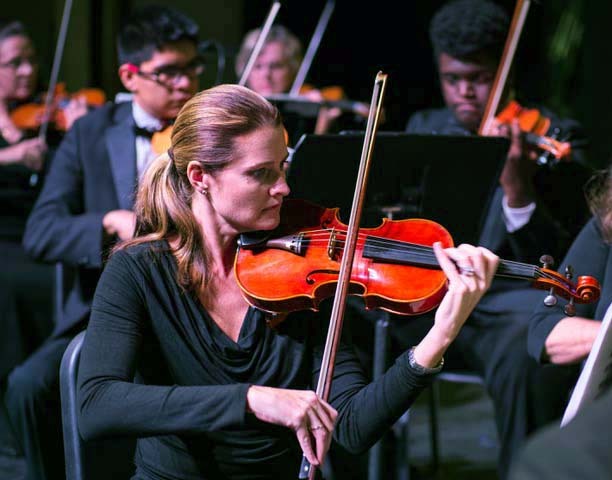 Experience the music from your favorite movies as North Valley Symphony Orchestra performs songs from Star Wars, Back to the Future, 007, Harry Potter, Forrest Gump, Spider-man, The Wizard of Oz, Dances With Wolves, Frozen, and more. “Back to the Movies,” the final concert of the 2016-17 season, is Saturday, May 20th, 7:00 p.m. at North Canyon High School Auditorium, 1700 E. Union Hills Drive. This concert guarantees fun for the whole family. Instead of tuxes and formal dresses, orchestra members will be dressed as their favorite movie characters. Audience members are encouraged to do the same. Arrive early for the opportunity to be photographed with orchestra members before the concert, who will also be happy to pose with you during intermission. The lobby will be decorated with movie character cut-outs and posters for additional photo opportunities. NVSO Youth Orchestra will close out their season by also taking the stage for a short time to perform Robert Longfield’s arrangement of Star Trek. Young musicians interested in playing with NVSO Youth Orchestra should contact Youth Music Director, Josh Lynch, to schedule an audition for the 2017-18 season. Auditions are being scheduled for a variety of time slots on Sunday, May 21st. The NVSO Guild will be raffling off a movie-themed basket that includes Harkins movie passes and movie goodies. There will also be a silent auction with items specific to movie paraphernalia provided by Charity Benefits Unlimited. NVSO is committed to making concert tickets affordable for all, and encourages entire families to attend. Ticket prices are only $5.00 each concert, and can be purchased on-line at www.northvalleysymphony.org.